A new parking system at Boston’s Pilgrim Hospital has led to chaotic scenes, with angry visitors facing long queues in the cold and rain. Health bosses last week apologised for the disruption and said they would not be issuing fines to anyone caught out last week and would also reimburse those who had overpaid for any reason. But the problems have continued into this week, with a number of readers contacting the Standard about it, and dozens posting on Facebook. Complaints have included queuing times of up to 40 minutes in the cold and dark, confusion over how the system works, particularly for disabled drivers, and lack of lighting at the machine. John Reed, who is 78 and recently had a heart attack, said he has been forced to walk to and from his car to get his blue badge, and then either queue for a long time in the cold and rain or face another long walk to a different machine. He says the way the new system has been installed is a disgrace. “There was murder there on Tuesday night as people tried to work it out,” he said. Simon Middleweek from Worcester has been visiting his father at the hospital: “I’ve been for the last couple of nights at about 5.30pm and it is just horrendous. “The pay machine is a in a dark area, which they made the effort to put a battery operated light above which is now not working. Mr Middleweek is visiting his father, Colin, a retired squadron leader who gave 48 years service to the RAF. He says it is horrendous that his mother is having to endure this ordeal simply to pay to park her car whenever she visits. He said he was urging everyone he spoke to in the queue to write to the town’s MP Matt Warman as well as complaining to the Trust. And Graham Harris said the whole thing was a ‘shambles’. He said there was no clear signage and confusion over when and how people should pay for their disabled badge tickets. “It is an absolute shambles, hardly anybody knew how to pay and many thought parking was free, as the barriers were up & the usual machines were taped over. The signage was either non-existent or completely incomprehensible,” he said. 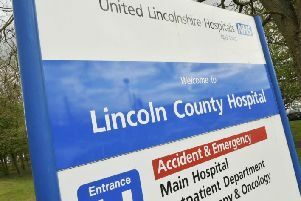 The issue was raised at United Lincolnshire Hospital Trust’s board meeting when it was confirmed that there will be no penalty charges for those affected by the changes last week. Director of Estates and Facilities Paul Boocock apologised to anyone who had been inconvenienced by the system. “We would like to thank everyone for their co-operation while we introduce the new system at our hospitals. There have been teething problems while we get it embedded. All of the car parks are now up and running and I would like to reassure members of the public that we are listening and trying to address some of their concerns.